More than 21 years after “King King,” The Red Devils are ready for international exposure again. UK journalist Paul Rees has taken on the Devils for an article for an upcoming edition of Classic Rock magazine. The story comes on the heels of a feature in the November 2013 Classic Rock on unreleased albums. 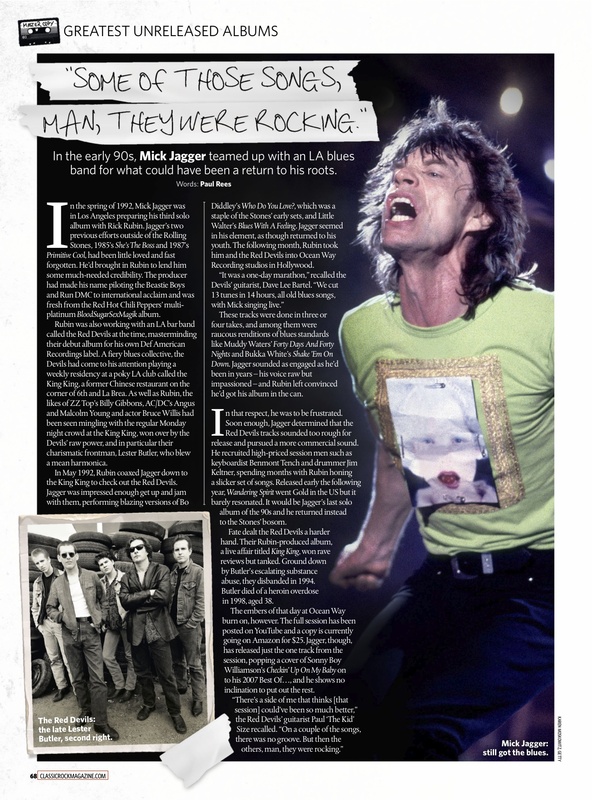 Rees wrote an item on the Mick Jagger blues album. No new ground was broken, but it serves as a prelude to a larger feature on the Devils. We know Rees has been in contact with band members, so the story will be first-hand — and a first of its kind. The “King King” lineup has rarely been interviewed about the album, and certainly never by a publication as mainstream as Classic Rock. Rees is no stranger to the Devils. He told us that he saw the band a couple of times in the early 1990s in London, and interviewed Lester Butler at the time. His latest book, “Robert Plant: A Life” (HarperCollins), was released in October of last year. His work has appeared in The Independent, Classic Rock and the Evening Standard, and he has been editor of Q and Kerrang! as well, according to his Amazon bio. When we know more, we will have it here on No Fightin’. This entry was posted on January 5, 2014 at 11:00 am and is filed under red devils with tags classic rock, king king, Mick Jagger, robert plant. You can follow any responses to this entry through the RSS 2.0 feed. You can leave a response, or trackback from your own site. That will be the first issue of Classic Rock I’ve bought in quite some time…Many thanks for letting us know! And thanks for this video, one of my all-time favourite music videos. I wish the band had recorded this one as a single. It’s too bad they didn’t…I love everything about it but that rhythm section knocks me out.